B2B marketers, do you ever get the feeling that buyers just aren’t that into you? Sure, they might read some of your content. They fill out a form on occasion. But even if they actually make a purchase, it can feel like they will never be as invested in the relationship as you are. Don’t head for the marriage counselor just yet, though. A recent LinkedIn study of over 6,000 B2B buyers, marketers, and salespeople shows that 28% of buyers rate their vendor relationship as “very good,” while 56% rate it “good.” That means your customer-focused marketing and sales tactics have created healthy relationships with 84% of your buyers. Our latest eBook, Rethink the B2B Buyer’s Journey, seeks to understand what buyers are looking for from vendors, what strengthens relationships, and what causes buyers’ affection to wane. It gives the blueprint for a joint effort across sales and marketing to support buyers through every stage of the journey, from prospecting to customer care. 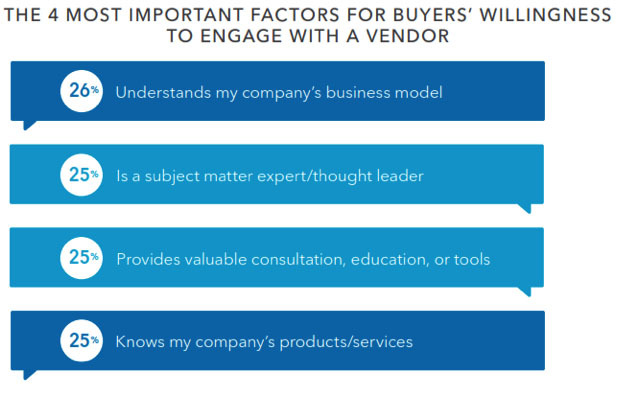 When we asked, “what are the important factors in your willingness to engage with a vendor,” the top four responses all centered on demonstrating knowledge and establishing credibility. It makes sense that a buyer’s chief concern is that vendors know how their company makes its money. It’s difficult to show how your solution aligns with goals if you lack a clear picture of what the goals are in the first place. Without that understanding, you end up pitching your solutions’ features and benefits, rather than showing specifically how it improves their quality of life. That’s the opposite of customer-driven marketing. Strategic B2B content marketing is a powerful force for demonstrating your knowledge of how your buyer’s company does business. It starts with research into what your buyers are talking about, from the questions they most frequently ask to the web searches they perform. That way, you’re sure to create content that is relevant to their business model. Don’t be afraid to take your content outside of the specific intersection between your product and their business, too. Many B2B companies are reluctant to create content outside of the obvious “this is a problem you have, this is how our solution solves it” paradigm. You can build a stronger relationship if your content accounts for the entire business model, not just where your solution fits in. Building thought leadership is important for every stage of the funnel. For buyers who are just starting to look, it puts your content at the top of the page. In the middle of the funnel, subject matter expertise guides buyers toward your solution. In the lower funnel and after the sale, thought leadership continues to reinforce that the buyer made a good decision partnering with your organization. A healthy content marketing strategy includes all three types of thought leadership to position your organization as a knowledgeable, indispensable resource. 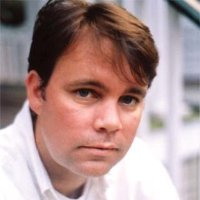 “Your content should provide value” is a basic tenet of content marketing. It’s built into most content marketing definitions. But we’re not giving that value away—we’re proposing a trade. We exchange utility for buy-in, whether it’s filling out a contact form, making a purchase, or just continuing to explore more content on the site. The more value your content provides, the more likely it is that buyers will reciprocate by providing their attention and contact information. Make sure your content demonstrates your company’s knowledge and expertise in an actionable way. Readers shouldn’t have to click the CTA to get something that makes their lives easier—there should be a benefit that comes just from consuming the content. Successful B2B marketing in the digital age requires organizations to build strong, lasting relationships with their buyers. You can strengthen these relationships with content that shows deep understanding of your buyers’ business, demonstrates thought leadership, and continually adds value. With a strategic blend of quality content, you can make sure buyers are not only into you, but ready to take the relationship to the next level. To further explore the new realities of B2B marketing, download Rethink the B2B Buyer’s Journey.